Accommodations in centrally-located three-star or four-star hotels. Rooming on a double basis. Inside cabin on Day 4 aboard ship. All breakfasts. Six lunches. Five dinners. Dinner aboard cruise ship on Day 4. 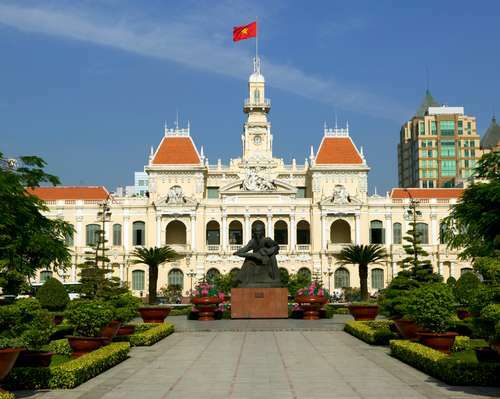 After following the sun over the West Coast of the United States, crossing the Pacific Ocean and the International Date Line, you arrive in Hanoi, Vietnam's small, elegant capital and one of the oldest and most beautiful cities in Asia. Hanoi challenges the reputation of Socialist cities for being gray and uninspiring. Its temples and the narrow lanes of the Old Quarter still retain the mystery and charm of past centuries, while the tree-lined boulevards are reminiscent of Paris, France. Today's sightseeing includes cultural and historical landmarks, starting with the venerable Confucian sanctuary called the Temple of Literature, the One Pillar Pagoda and the Ho Chi Minh Memorial Complex. In this lovely park stand the Ho Chi Minh Mausoleum, where visitors pay respects to the embalmed body of the Father of the Nation, and the Ho Chi Minh's Stilt House, a simple dwelling where he lived from 1948 until his final days in 1969. You will also see the Tortoise Pagoda, on a tiny isle in Hoan Kiem Lake, in the heart of Hanoi, and colonial buildings such as the Opera House and St. Joseph's Cathedral. A half-day local guide, well-educated and specially-trained on the history and culture of Hanoi, will accompany your group. Set out for Halong Bay, where 1,600 oddly-shaped islands and islets framed by limestone cliffs punctuate a gorgeous, emerald green sea. This is one of the most impressive seascapes on earth, now listed as a UNESCO World Heritage Site for its outstanding beauty and great biological interest. A traditional wooden junk with elegant butterfly sails will take you to some of the Halong Bay islands to explore the caves. Observe the rhythms of daily life on the bay as you sail past fishermen casting their nets, floating villages and pearl fisheries. 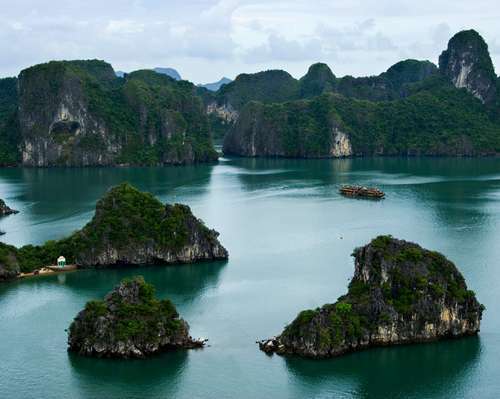 You will cruise the bay and enjoy a special Vietnamese dinner on board before your overnight on a Bai Tho Junk. Enjoy the morning on board as your junk cruise continues. Hop on a small boat for a visit to Luon Cave, a submerged grotto on Bo Hôn Island. The ride to the capital city includes travel on small roads, past small towns that seem a world away from the metropolis. Enjoy a traditional Water Puppet Show, a fascinating art form originating in North Vietnam and best seen in Hanoi. A flight takes you to Danang, Vietnam's fourth largest city. Explore the Marble Mountains, a region of five peaks south of Danang that's riddled with sacred caves and enveloped in legend. You may wish to visit the Museum of Cham Sculpture, famous for its exquisite terracotta and sandstone figures from Kingdom of Champa, a culture with Indian roots that spanned a thousand years between the 7th century and the middle of the 19th century. Travel to an architectural marvel frozen in time. A unique walking and cyclo (trishaw) tour in Hoi An's Old Town introduces the fusion of Chinese, Japanese, Vietnamese and European buildings which date back to the 17th, 18th and 19th centuries, when Hoi An was one of Southeast Asia's major ports. Hoi An has been called Vietnam's most picturesque town. You'll see Quan Cong Temple, Phuoc Kien Pagoda, the Japanese Covered Bridge, Tran Family Chapel and Phung Hung House. Drive north along Vietnam's famous Highway 1, up and over the spectacular Hai Van Pass (Pass of the Ocean Clouds), to Hué, the Imperial City of the Nguyen Dynasty and the scene of one of the most unexpected and bloodiest battles of the Vietnam War. Enjoy the controlled chaos of river life on a boat cruise along the Perfume River, passing small vessels laden with produce and fresh fish headed for market. Visit the Thien Mu Pagoda, the tallest pagoda in Vietnam and the symbol of the former Imperial capital city. Admire the stately grandeur of the Minh Mang Mausoleum, the resting place of the second Nguyen Emperor which is renowned for its beautifully-landscaped gardens and reflecting lakes. Enjoy a full day of sightseeing. Behind the walls of the Imperial Citadel, which you will visit, you will find the Imperial City, the Forbidden Purple City, beautiful gardens, esplanades, shops, museums and palaces such as the Dien Tho Palace, the Thai Hoa Palace and the Halls of the Mandarins. You will first notice Flag Tower, with its giant flag, and the imposing Ngo Mon Gate, which marks the entrance to the citadel. You will also see the Nine Dynastic Urns cast in 1836 as a symbol of the power of the dynasty, with each urn representing an emperor worshipped in the Dynastic Temple. Visit two of the most famous of the Nguyen Dynasty mausoleums, known for their unique way of blending in with their natural surroundings while providing a genuine reflection of each monarch's personality. Walk through the incomparable open-air Dong Ba Market (where virtually all citizens of Hué do their daily shopping). Board a flight to Ho Chi Minh City, the largest city in Vietnam. During the French colonial era (1859-1954) and the American occupation during the Vietnam War (1953-1975), the city, then known as Saigon, became the capital city of South Vietnam. As a result, Hoi Chi Minh City's architecture and urban planning displays a mix of East and West, with wide boulevards reaching out from the city center to Asian districts. Your sightseeing tour of Ho Chi Minh City starts on Dong Khoi Street, in the heart of the most fashionable and historic section of the city. You will pass by the ornate City Hall, the Opera House, the Neo-Romanesque Notre Dame Cathedral (quick visit) and the Old Post Office, unchanged since the 1880s. You will also see the bustling Cholon district (Ho Chi Minh City's Chinatown). A local guide, well-educated and specially-trained on the history and culture of Ho Chi Minh City, will accompany your group. Head out to the Cu Chi district, located a mere twenty miles from the center of Ho Chi Minh City, to view a section of tunnels that were part of a huge underground network dug throughout the country by the North Vietnamese Viet Cong soldiers, who fought against South Vietnam and its American allies. Stop in Tay Ninh to observe the midday service of the Cao Dai sect, an eclectic and most colorful fusion of Buddhist, Taoist and Confucian ceremonies. A guided tour will introduce this underground complex now at the heart of a war memorial park. You'll learn the history of this site, where over 75 miles of tunnels contained dormitories, fully-equipped kitchens, hospitals and even auditoriums. Those who don't suffer from claustrophobia will be eager to climb through these passageways. 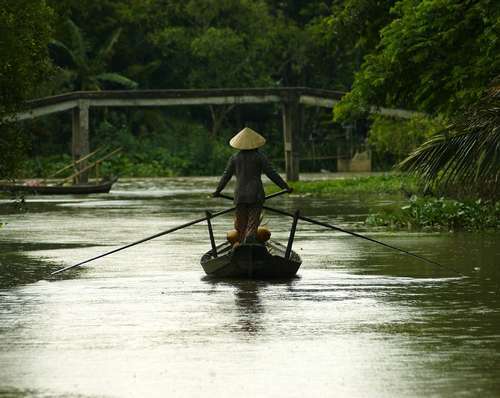 Today's excursion focuses on the Upper Mekong Delta. 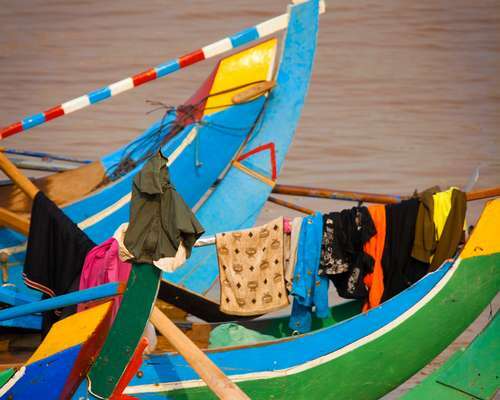 Take a ride on a traditional Asian longboat, past delta islands, on your way to the renowned floating market of Cai be. Check out the handicrafts and treat yourself to a typical snack, such as coconut candy, or crispy rice popcorn. 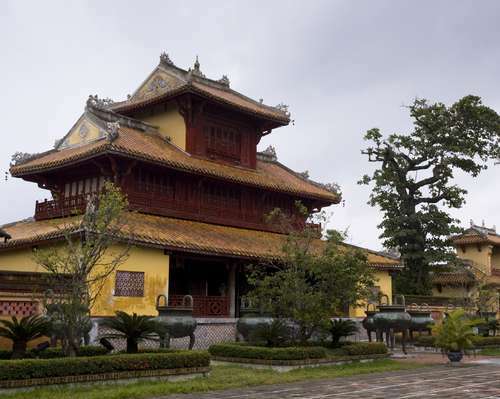 Enjoy a sightseeing stop at the Vinh Trang Pagoda, a beautiful Buddhist temple surrounded by ornamental gardens, which was built in 1849 with an harmonious blend of Khmer and European architectural styles. On to Ho Chi Minh City's Than Son Nhat Airport for the return flight home. 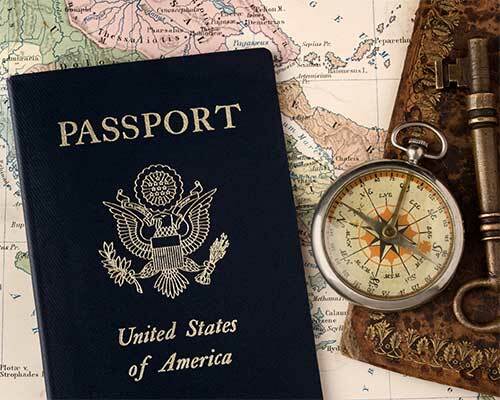 You'll cross the International Date Line again before arriving back in the States the same day, eager to share your discoveries with family and friends.